“We’re hurtling at breakneck speed to get from somewhere we didn’t want to be to somewhere we don’t want to go.” This astute observation, made by Sinclair Black, FAIA, during a long interstate drive from one city to the next, gets to the heart of the problem with contemporary transit. At its root: Rather than being measured purely by speed and volume of flow, the value of transit is dependent upon the quality of both the destination and the journey itself. 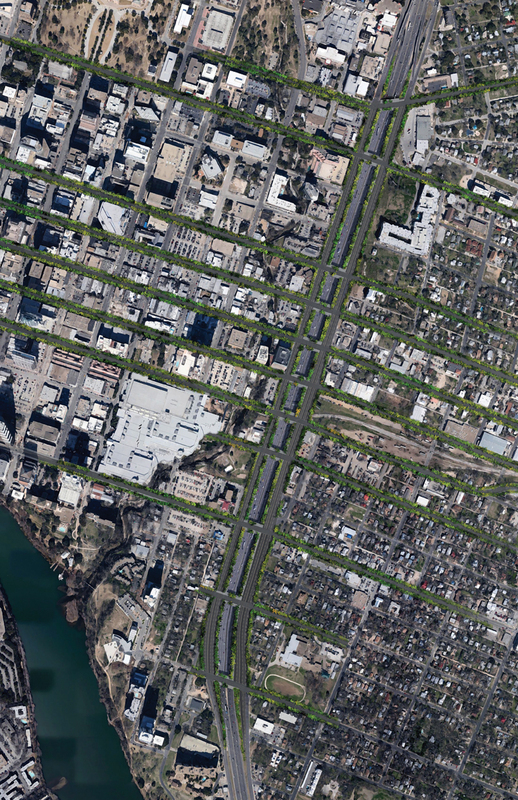 On that front, Austin finds itself at the precipice of a very large cliff of a decision regarding I-35 in its urban core, which will affect flow, connectivity, and the quality of life in the city. A fundamental component of urban design is the mobility of its people. The perceptual experience of moving through the city should be carefully considered, and the place where efficiency and experience meet is where I-35 currently falls short, as it neither efficiently enables flow nor allows for an optimized use of, or engagement with, urban space. Reconnect Austin, headed by UT School of Architecture Professor Sinclair Black and Heyden Black Walker of Black + Vernooy, is a long-term urban design solution that proposes to remedy problems caused by a highway running directly through an urban fabric; its focus is on creating assets in their place. The scheme, informally known as the “cut-and-cap” plan, aims to rejuvenate the highway corridor with a few conceptually simple yet bold and powerful moves to reconnect East and West Austin. In physical terms, the scheme proposes to depress the main lanes of the interstate below ground level, from Holly Street to north of 15th. A cap, at grade, would then extend along the corridor, replacing access roads with a boulevard, and thereby establishing a new tax base, allowing the zone to better function, and recapturing surface area for the city. Comparable precedents across the nation are reassuring, including Klyde Warren Park in Dallas, the Big Dig in Boston, and the High Line in New York — all of which repurposed urban transit infrastructure, and all of which have been more successful than anticipated due to use and activation of their respective downtown areas. Black points out that this proposal is not a transportation issue, as the problem is not primarily about transit. Instead, it is more about placemaking. Rather than seeing increased highway speeds as the primary initiative, the goal is to create a walkable environment of diverse and desirable places in the city. Currently, a commute across or into downtown is seen as something one endures, rather than enjoys as an experience in and of itself. 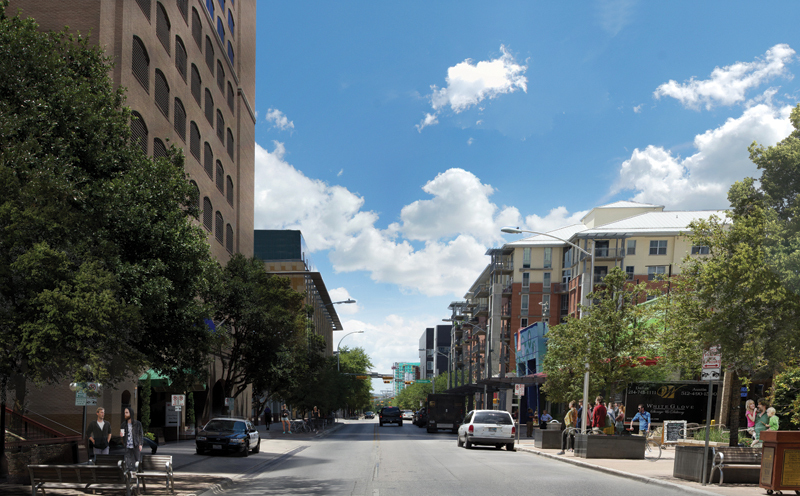 Reconnect Austin promises to create great streets and attractive boulevards, where choices for transit are increased to help alleviate congestion as an alternative to building more highway lanes. It could also be argued that the future of Waller Creek, for which there are elaborate plans that capitalize on its position parallel to the interstate, also depends on this proposal. For both initiatives to function optimally, a critical mass of density is required to create active street frontage and walkability. 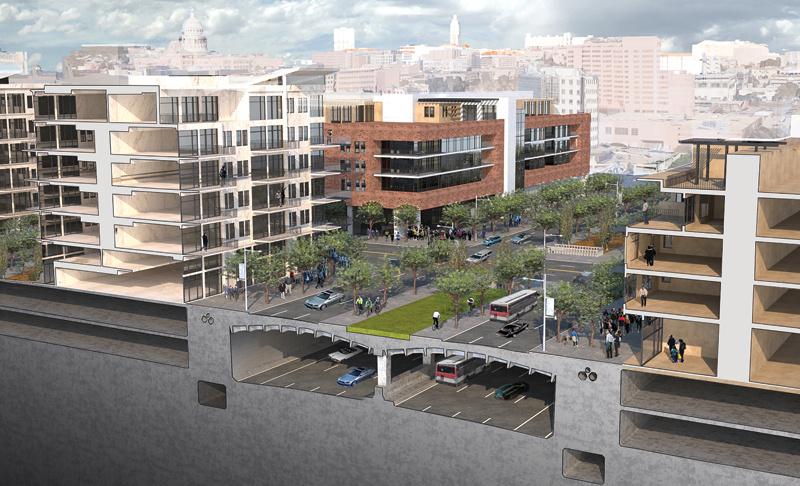 The plan proposes to develop the boulevards at approximately 50 units per acre, which is comparable to many downtown blocks and therefore continues the existing urban rhythm. In addition to improved use of space, the proposal seeks to address such intangibles as social equity. According to Walker, affordability is a critical part of the discourse; affordable housing could be among the new buildings within the recaptured area, allowing for more accessibility overall. Reconnect Austin has broad support from thousands of citizens and local businesses, who believe the city is “asleep at the wheel,” and potentially headed for a colossal missed opportunity. Regardless, billions of dollars have already been slated for repairs and improvements to I-35 — but to simply rebuild what already exists, by default. This would be effectively “recreating a disaster,” in the words of Black. In a much broader sense, the project is about vision. It is understandable that cities and government agencies can take a reactionary stance, patching up individual problems as they arise. Instead, Reconnect Austin is proactive, and is about a larger vision and working toward it in logical and linear phases. Austin has corridor plans for Congress Avenue, Lamar Boulevard, and East Riverside, among other streets, but has not adopted a vision for the proverbial elephant in the room: I-35. The interstate is the fourth most congested thoroughfare in the nation, and simultaneously one of the most dangerous in Austin, existing as a frustrating contradiction, where traffic can often be painfully slow, yet fatalities are high. All cities exist as a collage of distinct zones and districts, and the thresholds between each are what define the success of its urban fabric. Reconnect Austin intends to transform a threshold that is currently a barrier into more of a bridge, literally and figuratively, to connect Austin in the East-West direction. Perhaps the focus should be less on what it costs, and more on what it yields. The project promises to pay for itself financially in the long term, by increasing Austin’s tax base — a truly sound return on investment. Furthermore, it promises a well-rounded urban space with a mix of program types for working, living, and shopping — not to mention the plan’s health benefits, which include carbon sequestration via the trees on the recaptured space and exhaust ventilation of the covered highway. 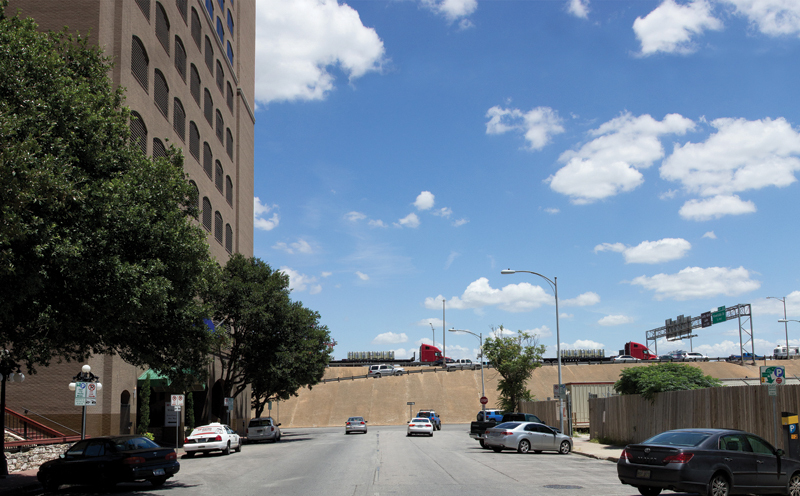 The Texas Department of Transportation is set to formally consider and examine the proposal, which aims to unify the urban landscape while at least isolating traffic, if not removing it completely from downtown. Austin’s mythical dynamism, vibrancy, and quality of life are threatened by her growth, raising the stakes on the way she manages her infrastructure, or rather how her infrastructure manages her. Matt Fajkus, AIA, is an associate professor at The University of Texas at Austin School of Architecture, and principal architect at MF Architecture. Reconnect Austin takes on a menacing aspect when one considers how vulnerable it will make East Austin neighborhoods. Gentrification takes no prisoners. To cite just one example, look at how SoCo raped the 78704 area – I speak as one who sold out to escape the carnage, but I’m white and thus less vulnerable to the worst of it. Far from preserving “a collage of distinct zones and districts,” Austin’s transformation into a city with the soul and conscience of a developer is creating economic refugees at a frightening rate, and this project can only streamline the systematic displacement of commoners in favor of the privileged. There’s no alternative to gentrification. It’s a side effect to the economic prosperity created by the city through opportunity and the free movement of people that want to live and work in that city. As the amount of money being made within a downtown center rises, so rises incomes which push up the price of housing. Sounds great but I have to wonder of the state would even help fund this in such a contentious political climate. Don Taylor, But what is the alternative? I’ve seen studies that show that normally is it continuous neighborhood decline. Investment is expensive and to cover the costs you have to charge certain amount, that’s just economics. The key is to make sure that people are treated fairly during the process and to put in incentives to make sure that subsequent developments feature a variety of housing modes and pricing. Kudos to Sinclair Black for advancing the conversation.